This is a completely refurbished and redesigned three bedroomed detached family bungalow located in the heart of the popular village of Nettleham. The property has modern, stylish and luxury living accommodation to comprise of Reception Hallway, three Bedrooms, Luxury Family Bathroom, En-Suite to Bedroom 1, Breakfast Room, High Specification Kitchen and Lounge. Outside there is a driveway, garage and lawned gardens to the front and rear with paved seating area. LOCATION Nettleham is located approximately four miles North of Lincoln City Centre and has many attractive features such as The Beck and Village Green, around which are local shops, Co-op Superstore, public houses and other amenities. There are infant and junior schools in the the village and all grades of schooling are available in Uphill Lincoln and nearby villages. RECEPTION HALLWAY With hardwood door and hard wood double glazed window to the front aspect, solid wooden flooring, radiator, lightwell to ceiling and doors leading to the Breakfast Room, Family Bathroom, three Bedrooms and airing cupboard housing the gas central heating combination boiler. 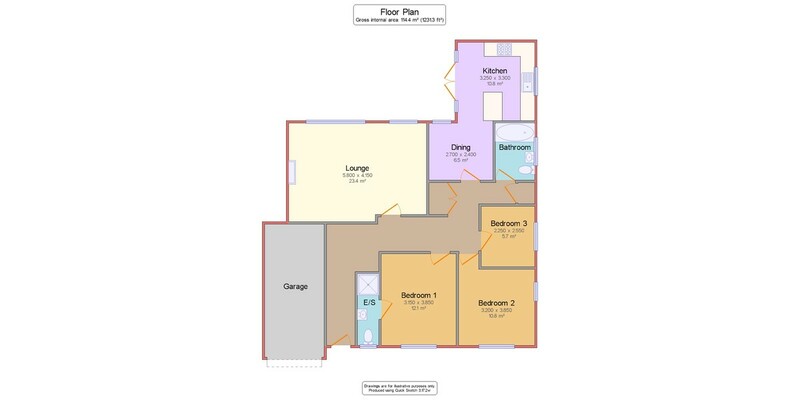 BEDROOM 1 10′ 3" x 12′ 6" (3.12m x 3.81m) With uPVC window to the front aspect, radiator and door to the En-Suite Shower Room. EN-SUITE SHOWER ROOM 9′ 10" x 2′ 11" (3m x 0.89m) With uPVC window to the front aspect, tiled flooring, suite to comprise of WC, wash hand basin and shower cubicle and chrome towel radiator. BEDROOM 2 10′ 5" x 10′ 5" (3.18m x 3.18m) With uPVC windows to the front and side aspects and radiator. BEDROOM 3 8′ 5" x 7′ 7" (2.57m x 2.31m) With uPVC window to the side aspect and radiator. FAMILY BATHROOM 8′ 0" x 5′ 4" (2.44m x 1.63m) With uPVC window to the side aspect, feature tiled flooring, partly tiled walls, suite to comprise of bath with shower over, WC and wash hand basin in vanity unit and chrome towel radiator. BREAKFAST ROOM 8′ 2" x 8′ 11" (2.49m x 2.72m) With uPVC window to the rear aspect, wooden flooring, radiator and leading into the Kitchen. KITCHEN 10′ 7" x 10′ 10" (3.23m x 3.3m) With uPVC windows and double doors to the rear garden, wooden flooring, fitted with a range of quality modern wall, base units and drawers with solid oak work surfaces over, ceramic sink unit and drainer with mixer tap above, integral appliances to include fridge freezer, dishwasher, automatic washing machine, oven and four ring induction hob with extractor fan over and breakfast bar. LOUNGE 19′ 8" x 12′ 1" (5.99m x 3.68m) With uPVC double glazed windows to the rear aspect, feature electric fire with tiled hearth and oak beam mantle over and radiator. OUTSIDE To the front of the property there is a lawned garden with flower beds and a driveway providing off road parking for vehicles and giving access to the Integral Single Garage. To the rear of the property there is a paved seating area, lawned garden and sheds. INTEGRAL SINGLE GARAGE 16′ 4" x 8′ 3" (4.98m x 2.51m) With up and over door to the front aspect, power and lighting.